Pekingese don’t need to eat a lot of food to keep their weight under control, so you don’t want to waste any of the servings on empty fillers. Densely nutritious foods help you keep your Pekingese at peak weight and can also help prevent any allergic reactions. Pekingese is a royal breed with plenty of personality and show-stopping looks. They may be small, but their owners affectionately call them “opinionated.” They tend to form a bond with their favorite owners and are content to sit next to them all day. They have fantastic hair and plenty of energy. Quality food will help them keep that beautiful coat healthy and their long lives full of joy. They may be cherished members of the former imperial family of China, but these down to earth dogs make excellent family companions, provided there’s enough peace and quiet. Let’s take a look at what it’s going to take to keep them healthy. Some owners feed their Pekingese to the point of obesity but using quality food helps keep your Pekingese in good shape. Proteins build muscle tone and keep the coat shiny and healthy while complex carbohydrates deliver energy without spiking blood sugar only to crash. Poor quality foods won’t help your Pekingese stay full or maintain energy throughout the day. Pekingese are generally pretty healthy, but they do have a few things you should watch out for as your Pekingese matures and then ages. Let’s take a look. Smaller dogs often have trouble with their kneecaps popping out of place due to a genetic abnormality that alters the natural alignment of the joint. The condition often happens with excessive exercise or if your Pekingese gains weight. It becomes an issue with mobility, so foods that have quality proteins can help keep muscle tone strong to support those joints, plus supplements like glucosamine to help strengthen the joint itself. Some breeds with shortened faces have a lot of breathing issues. It’s essential to maintain your Pekingese’s weight to prevent those breathing issues from becoming more serious. Some dogs will have to have treatments to help keep the airway clear, but for many, strict weight management can create the best situation for companion’s breathing. With all the hair and folds in the skin, some Pekingese can have issues with the skin. Foods with plenty of fatty acids can help keep the skin soft and supple. Also, quality proteins help keep the coat healthy and shiny. Probiotics can keep digestion regular, which can help with some inflammation as well. Cheap fillers can cause issues with food allergies and could have detrimental effects on the quality of the skin. Protein should be the first ingredient in any food that you choose but not just any protein. You need to check that protein comes from whole sources that are clearly labeled. Ingredients like whole deboned chicken or salmon offer lean protein sources that keep your Pekingese in great shape. Fruits and veggies offer vitamins and antioxidants that support your Pekingese’s health and digestion. Other supplements could also be beneficial including essential fatty acids, which can help with skin health and glucosamine and chondroitin, which support joints. Your Pekingese isn’t going to eat a lot of food daily, so the proper balance of protein and carbohydrates can help keep up energy levels without having extra calories. Those complete proteins combined with slow release, complex carbs prevent blood sugar spikes and offer good fiber for weight control. If your Pekingese has issues with food allergies, it can be helpful to switch to a limited ingredient diet. These use a single protein source plus a few ingredients to help alleviate allergies and return digestion to normal. Cheap fillers can cause a lot of allergies, and they offer absolutely no nutritional value whatsoever. Many companies use them to bring down the cost of the food, but in the long run, you’ll end up paying more for vet bills. Proteins from unlabeled sources or by-product meals are not quality sources of protein and should not be in the ingredients list. Also, artificial flavors only encourage your Pekingese to overeat or to eat too fast. Artificial colors just convince you that food is healthier than it actually is. All of these types of foods are not good for your Pekingese. 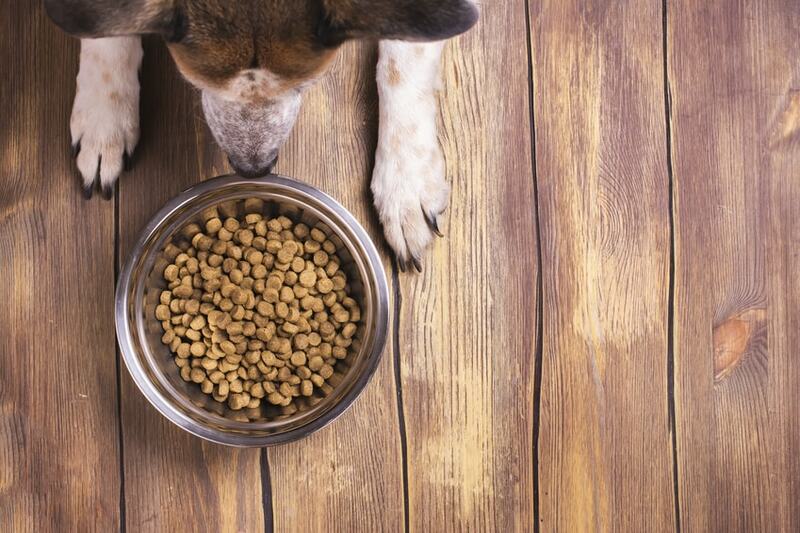 Some pet owners are switching to grain and gluten-free foods, but a worrying condition called Canine Dilated Cardiomyopathy has been recently linked with a diet heavy in potatoes, peas, and legumes. Talk to your vet about avoiding these foods entirely or at least foods with those listed in the first two or three ingredients. We know that some foods are bargain choices, but they don’t offer much in the way of nutrition. You might save money in the short term, but you’ll end up with more vet visits in the long run if your food can’t support your dog’s health. Kibbles N Bits: There’s a healthy dog on the bag, but this food uses everything on the list we said to avoid. It’s not going to support your Pekingese’s health at all, so don’t fall for the bargain. Pedigree: This might be another classic option, but it also isn’t going to support health or wellbeing. It’s affordable, but that’s about it. It uses corn and soy as cheap fillers, plus by-product meals for protein sources. Alpo: Both the wet and dry options have been recalled multiple times, and the recipe uses a lot of cheap fillers. The protein sources aren’t always clearly labeled, either. It might be affordable, but it’s just a bad decision overall. The average adult Pekingese is between six and 14 pounds total, so yours isn’t going to need much food to maintain a healthy weight. Check with your vet for individualized recommendations, but here’s a bit of what to expect. Puppies: Your vet will probably change recommendations a few different times throughout your puppy’s maturation. Make sure that you follow your vet’s prescribed diet to build good health from the beginning. Adults: Adult Pekingese won’t get much food throughout the day. Most will receive only about a cup of food divided up over several meals to help keep energy up, but check portion sizes on your chosen food. Senior: Seniors will have similar nutritional guidelines as younger dogs, but you may alter portion sizes a bit if your Pekingese has become overweight or inactive. Senior weight control formulas can be a great help here. Your Pekingese needs densely nutritious foods to keep up muscle tone and skin health. Each food should have quality ingredients and good supplements for coat and joint health to keep your Pekingese in peak condition. Our first food is a limited ingredient recipe made specifically for small breed dogs. It uses whole turkey for complete proteins plus quality carbohydrates to keep your Pekingese’s energy up. It also contains fatty acids for coat health and glucosamine for joint support. It’s free of grains, fillers, and artificial flavors. Nulo provides holistic nutrition options for your Pekingese. They use only premium ingredients from trusted sources to create recipes that satisfy the nutritional needs of your companion. Once only available in specialty stores, they’ve expanded their reach to be more easily accessible to owners everywhere. Blue Buffalo’s recipe uses LifeSource bits, a blend of their vitamins and minerals. The whole protein source uses healthy chicken and brown rice for a healthy weight option. Essential fatty acids help keep the skin and coat healthy while glucosamine helps protect joints. It has no corn, soy, grains, or poultry by-product meals. Blue Buffalo began in the search for the perfect food for a beloved Airedale Terrier, Blue. Now, you can have the best nutrition for your beloved pet just the same. You can trust Blue with your pet’s health because the company uses only locally sourced ingredients from trusted providers. Tasty Turkey Fare is a cooked dish that uses limited ingredients. Whole ground turkey plus fresh vegetables give your Pekingese plenty of nutrition using human grade ingredients that appear at your doorstep in easy to serve portion sizes. It’s excellent for Pekingese dogs that have dental issues because the meals are easy to chew and digest. NomNomNow was created by a professional animal caretaker who wanted to provide proper nutrition in easy to consume formulas. Each meal is cooked in NomNomNow’s kitchens and then delivered to your door ready to refrigerate. They use only human grade foods with simple recipes to provide a comfortable balance between the convenience of feeding kibble and the dense nutrition of raw diets. Puppies change a lot in a few months. A growing puppy needs guaranteed levels of calcium and phosphorus for healthy bones plus DHA for healthy brain development. Puppies shouldn’t gain weight too quickly even in small breeds because any excess weight only causes problems later. Merrick’s Lil’ Plates is formulated especially for small breed puppies that may have trouble chewing standard sized kibble. It uses a grain-free formula with whole, deboned chicken and sweet potato for the perfect balance of protein and carbohydrates. It contains guaranteed calcium and phosphorus levels for healthy bones and DHA for brain development. Merrick is a Texas-based company that uses only locally sourced ingredients for their premium kibbles. They test each recipe thoroughly using expert advice from trusted pet experts and use no cheap fillers or artificial flavors that can cause reactions. Nulo Freestyle Turkey and Lentils is formulated for the needs of small breed puppies. It’s low glycemic, blending quality proteins with slow release carbs for all-day energy. The can sizes are smaller, making storage a lot easier, and with guaranteed calcium and phosphorus plus DHA, your growing puppy has all the building blocks for better health. Nulo provides wholesome nutrition for families dedicated to providing the best for their dogs. Each recipe is carefully crafted according to recommendations from trusted pet experts, and all ingredients are sourced from trusted suppliers. Seniors will need similar nutrition as they did when they were younger, but it may be time for a weight management formula if your Pekingese has become less active. Pekingese with teeth problems could also benefit from wet food to make chewing and digestion easier. Now Fresh’s weight control formula is formulated for small breed seniors who need some help maintaining a healthy weight. It’s grain free and uses only whole proteins with complex carbohydrates to provide all-day energy without empty calories. Glucosamine and chondroitin support aging joints while essential fatty acids help keep skin happy and the brain healthy. Now Fresh uses premium ingredients to create formulas that can support lifelong health and wellbeing. Each ingredient is explicitly chosen based on expert recommendations, and the company proudly uses either locally sourced ingredients or those carefully vetted from trusted suppliers. Nutro’s wet food is an excellent alternative to kibble for senior dogs who can’t chew very well. It contains good moisture and fiber plus quality, lean proteins from chicken, lamb, and salmon. Glucosamine and chondroitin plus essential fatty acids help support joints, brain health, and skin health. Nutro’s foods are carefully crafted to satisfy what your dog needs to stay healthy and allergy free. The company uses premium ingredients with no cheap fillers, artificial flavors, or artificial colors and thoroughly tests each recipe to ensure it performs up to standards. Your Pekingese is an elegant companion who can live a long time with proper nutrition. Maintain joint health and keeping the skin and coat happy depends on a quality diet without common fillers used in bargain foods. Investing in your Pekingese diet pays off in the long run when you’ve got a happy, active friend who doesn’t have to slow down due to weight issues or inflammation. Help your Pekingese stay healthy, and the two of you can get back to what you love whether that’s laying on the couch or heading outside.